Order the Vitamix Ascent 20oz Blending Cups Starter Kit with free U.S shipping HERE! Order the Vitamix Ascent 8oz Blending Bowls Starter Kit with free U.S shipping HERE! Order the Vitamix Ascent Series A3500 with free U.S shipping HERE! At last these little gems have arrived! Some of the biggest things come in small packages. Vitamix announced these blending accessories months ago and now they have arrived in the middle of summer, and it couldn't be a better time. Vitamix has been best known for it's name in the restaurant and smoothie shop industry and has presented itself well in the home as one of the best Chef's tools. What the company hasn't been known for is what it's competitors such as Ninja and Nutribullet have been popular for, and that would be single-serve blending. The 20oz Blending Cups Starter Kit has resolved all of that. The 20oz Blending Cup Starter Kit is designed only for the new Vitamix Ascent Series machines, such as the A3500 (shown above). 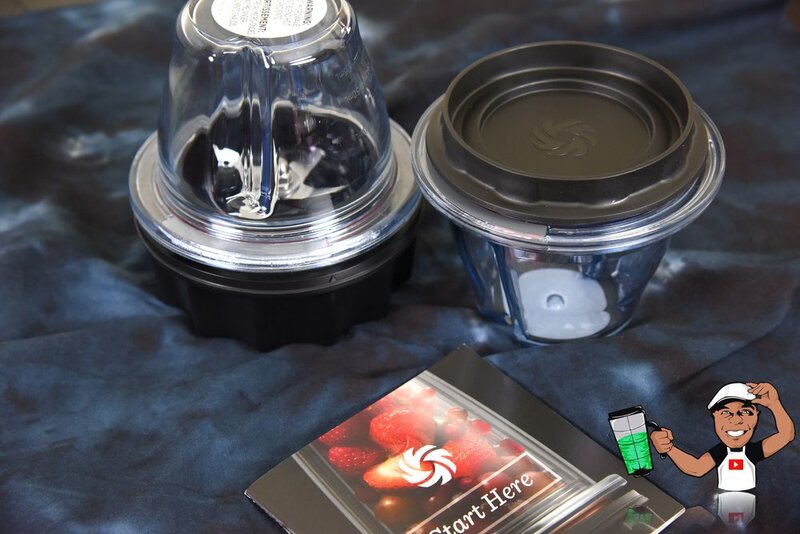 It's packaged with (2) 20oz blending cups, a set of blades and Start Here booklet with starter recipes. 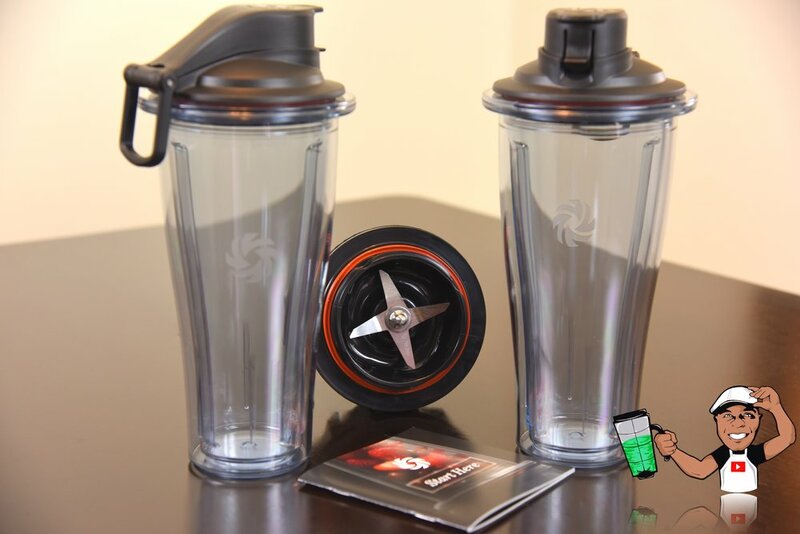 If you have a Legacy Vitamix machine such as the Vitamix Pro 750, Vitamix also makes the Personal Cup Adapter which comes with (2) 20oz blending cups and a set of blades . You can see that HERE. Perhaps the most anticipated Vitamix accessory ever! When I first saw the 8oz bowls months back, my first thought was they were just way too small to blend enough food to satisfy a hummingbird 😂. Shortly thereafter I saw the benefits. I envisioned the 8oz Bowl Starter Kit replacing those cheap low-performing herb/coffee grinders and mini food processor choppers. I also envisioned making a quick salsa for 1 or 2 people, making fresh purées for dessert toppings and baby food. The 8oz bowl may replace all of your mini appliances that are cluttering up your cabinets. The 8oz Bowl Starter Kit is packaged with (2) 8oz bowls, a set of blades and a Start Here booklet with starter recipes. If you've owned the Nutri Ninja or Nutribullet then you're familiar with the quality of blending cups/containers that ship inside the box. The Vitamix Ascent Series blending cups/bowls are 100% better. The 20oz single-serve cups are designed with a double wall (a second cup inside infused with the outer layer). This helps greatly with keeping hot liquids "hot" and cold liquids, such as smoothies, frozen for longer periods of time. The BPA-free plastic is thicker so hot/cold liquids are barely felt by hands. The BPA-free 8oz blending bowls are very thick in design. This helps to withstand breakage from milling hard ingredients such as cinnamon sticks or whole nutmeg. 20oz cup and 8oz bowl with lids and gaskets. Each of the Vitamix 20oz cups and 8oz bowl kits come with (2) lids that contain removable red gaskets. They are very effective against accidents/drips or leaks. I like that they are very easy to remove for cleaning (which I recommend often) and do not interact with foods. A word of caution however, the gaskets need to be sitting completely flat around the lids in order to protect from leakage. 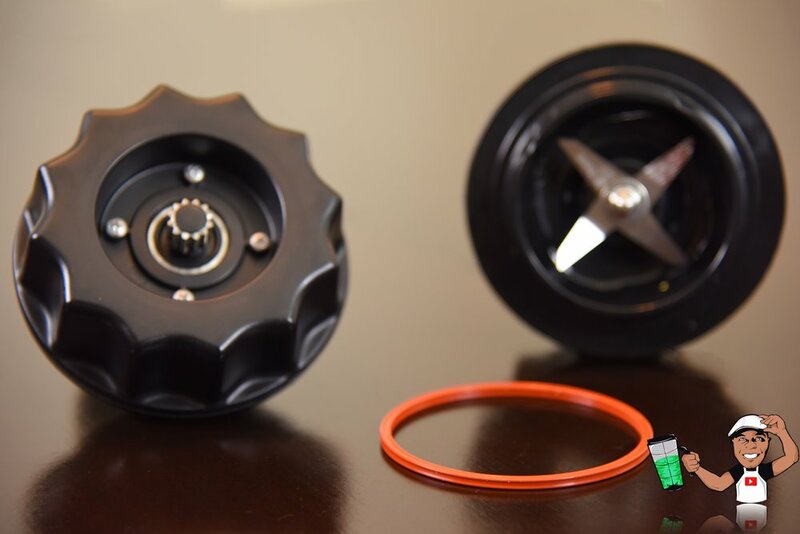 If you're familiar with the Vitamix S55 Personal Blender then you've seen the blending blades that come packaged with it that very much resemble the ones in the above pictures. The S55's blades are not compatible with the Ascent 20oz cups and 8oz bowls, but they use the same durable 3" laser cut stainless steel blades. The housing of the blades is extremely durable with good use of high quality metals and BPA-free plastics. Unlike most models of Nutri Ninja and Nutribullet, the Vitamix blades come with thick metal gears for longevity and will withstand wear and tear. The same red circular gasket found on the lids of the 20oz and 8oz containers is also used on the blades, and as I mentioned earlier, be cautious making sure the gasket is sitting completely flat around the blades housing to protect from leakage. Both the 20oz cups and 8oz bowl sets are designed with the Ascent Series Self-Detect technology. 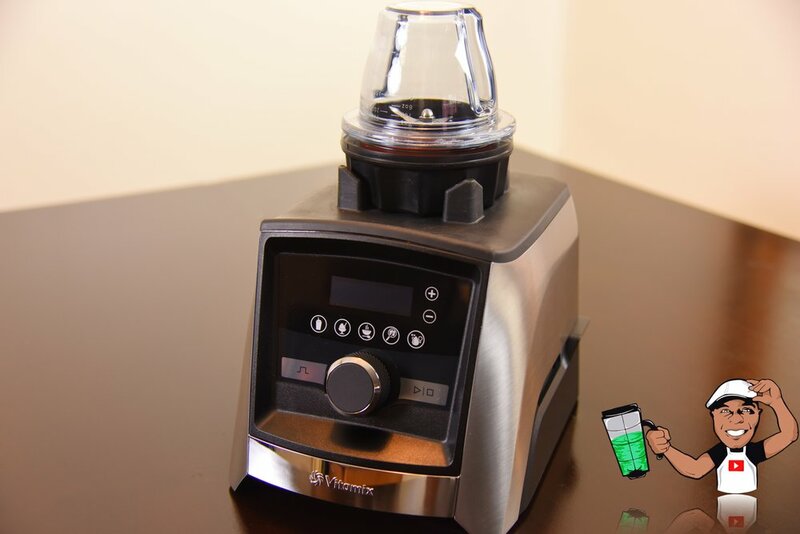 Upon placing them onto the Vitamix Ascent Series A3500 (shown above) it will automatically detect which type of container is in place and will adjust blend settings. For example, when using the 64oz Ascent container the smoothie preset will show a blending time of 50 seconds and starts off on speed 5. 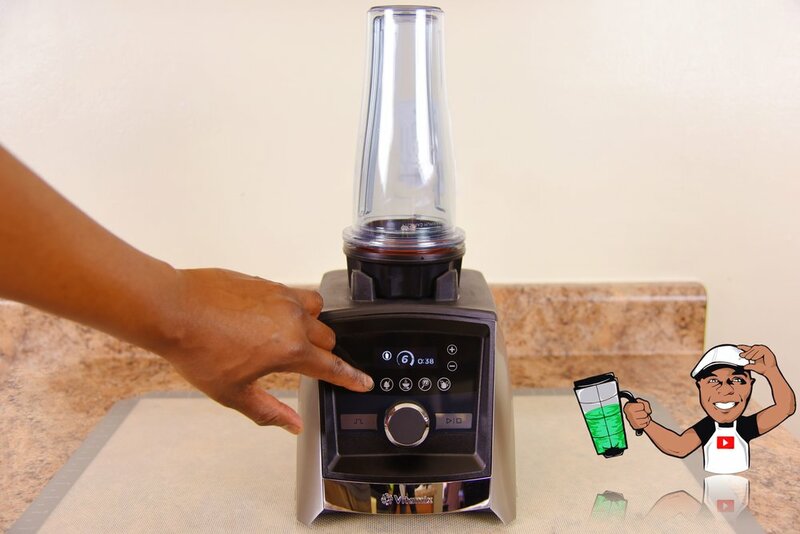 In the pictures above, the smoothie preset shows a blending time of 38 seconds and starts off on speed 6. Interesting to note, both the 20oz and 8oz containers have the same settings for each preset, even though they are different sized containers. For the Ascent 8oz blending bowls. I like the Blend & Store lids, love the small size, not-so-found-of the measurement markings being difficult to see, which require viewing the bowl at certain angles to see the markings from 1oz to 8oz, as shown above. For the Ascent 20oz blending cups. I like the single-serve size, love the Blend & Travel design, not-so-found of the lack of measurement markings which may slightly handicap the user from making the perfect smoothie without using a separate measuring cup for the ingredients. Both the Ascent 20oz blending cup and 8oz blending bowl kits come with a full 3 year warranty that covers all parts, labor and shipping both ways for service. While both products are 100% dishwasher safe, I would recommend using the top rack in your dishwasher, and if you're like me who prefers hand-washing I would recommend this first and foremost. 20oz blending cup and 8oz blending bowl shown with included set of blades. The Ascent Series Vitamix machines have arrived! The 20oz Blending Cup and 8oz Blending Bowl kits are the first batch of accessories to support them. These are without a doubt a Must Have for your Ascent Series Vitamix. Please feel free to leave a comment below and let me know what you think of these new Vitamix products or any questions that I may help you with. Thanks for reading. Thanks for supporting Blending With Henry! YOUTUBE VIDEO OF THIS REVIEW COMING SOON!